The loudspeakers currently occupying my listening room are a strange juxtaposition of cultures and designs. 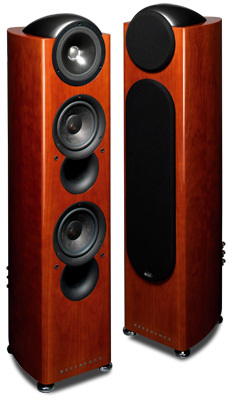 My reference speakers are a pair of tall, brown, rectangular, relatively ordinary-looking floorstanders from France: the Triangle Stratos Australes ($5699 USD per pair). Despite their Gallic heritage, their square, functional design lacks any sense of flamboyance, romanticism, high-end exclusivity, or haute couture. Parked next to them for review is a pair of speakers with personality and flair. They have round, black, bald pates (reminiscent of the high end of B&Ws 800 series), gorgeous curved sides, and reddish cherry veneer that made my wife look longingly and wonder aloud how much they cost (and, even worse, how much I might get toward their purchase by selling the Triangles). These are KEFs Reference 203/2 speakers ($8000 per pair), the latest version of the nearly-full-range speaker at the low end of their Reference line. With such bold and, dare I say, emotional elements in its design, one might think it was built in France, Italy, or Spain. But just to keep your stereotypes off balance, KEFs home is in England. Despite its English origin, KEF in no way equates with crumbling Saxon ruins or sports cars that spend more time in the shop than on the road. If youre reading this, chances are you know that KEF has been one of the more venerated marques in high-end audio for over four decades, and currently offers a wide range of products for home theater and almost any audio budget. You also likely know that KEF technology has been highly respected for an equally long time. For instance, back in the early 1970s, when computers were still a novelty in manufacturing (or anyplace else, for that matter), KEF was the first company to use computer-aided modeling to design speakers. That innovation allowed them to efficiently test and optimize the performance of virtual drivers and crossovers before building a prototype. The most striking result of KEF technology is revealed by removing the 203/2s grille. As KEF has done in its speakers since 1988, the tweeter is right in the center of the 203/2s 6.5" midrange driver. KEFs unique Uni-Q configuration is made possible with the use of small magnets of high flux density made of neodymium and other elements. The benefits of this configuration are obvious: by keeping most of the frequencies responsible for imaging (in this case, those above the crossover point at 300Hz) centered at a single point source, as they would be for a single full-range driver, the imaging has the potential to be steady as a rock. In addition, compared with a full-range driver, KEFs tweeter and midrange drivers can be optimally designed to cover their own frequency ranges without compromise. This assumes that the crossovers are of the highest quality; KEFs website notes that the crossovers are "computer-optimised" (thats the British spelling) and use audiophile-grade components. Furthermore, each finished speaker is tested to ensure that it performs within 0.5dB of its reference prototype. Lower, both sonically and physically, the Reference 203/2s three-way bass-reflex design uses two more 6.5" drivers to handle the bass. The ports are placed close to the drivers, however, and my initial response to this was something like alarm. I was concerned that sound coming from the ports might be out of phase and interfere with sound coming directly from the bass drivers. Despite KEFs reassurance that the bass is produced with "negligible distortion," I put that at the top of my "to listen for" list. In addition, I noted from the spec sheet that the Reference 203/2s bass is 6dB down at 40Hz, and the frequency-response graph that comes with the speaker shows the bass starting to roll off half an octave higher, at 60Hz. This was another concern: How would the 203/2 handle music with significant bass content? Another piece of KEF technology is Uni Balance, a built-in tweak you can use in your own listening space to partially compensate for your rooms bass and high-frequency performance. At the high end are four options for controlling the brightness of the Reference 203/2, and at the low end are two bass options. The ability to optimize the sound simply by adding or subtracting screw-in Uni Balance "buttons" is a welcome feature. A few more nuts and bolts: The KEF Reference 203/2s stated sensitivity is about average: 89dB. The impedance, while nominally 8 ohms, reportedly drops to 3.2 ohms at some point in the frequency range, so the spec sheet recommends at least 50W of amplification. For those using the 203/2 in a home theater, the speaker is also magnetically shielded. Weighing 58 pounds, the speaker is substantial but not immovable; its curved sidewalls are one of the lower-weight ways to minimize cabinet resonances. The 203/2s overall height of about 40" places its tweeter almost exactly at the height of my ears when Im sitting in the sweet spot in our listening room; very nice. I ran in the KEFs with near-constant play for well over a week before I began any serious listening. My associated equipment included a Cary Audio 306/200 CD player, a Bent Audio NOH passive transformer-based line stage, a Conrad-Johnson Premier 350 power amp, the Triangle Stratos Australes, a PS Audio Premier Power Plant power conditioner, Legenburg Hermes interconnects and power cords, Legenburg Apollo speaker cables (biwired), and ESP Essence Reference power cords. Before settling down to listen to music in a serious way, a certain amount of tweaking was necessary. The tweaks themselves were given the royal treatment by KEF and packaged in an incredibly high-quality "care-pack." Imagine a jewelry case of beautifully finished wood with an elegant metal R (for Reference) tastefully inlaid on the top, with separate little spaces inside for jumper cables, Uni Balance buttons, floor spikes and footers, a wrench for the spikes, and a bubble level. For a guy used to opening audio accessories and finding tweaks jumbled together in plastic bags, this was luxury. The Uni Balance feature didnt do much in my setup. At first listen, the treble of the Reference 203/2s sounded less prominent than from my reference speakers. The Triangles have a rear-facing tweeter to add to the ambience, and my room is therefore damped for high frequencies somewhat more than might be normal. Adding the Uni Balance button on the back of the KEF 203/2 raised the treble about 0.75dB, according to the user guide, but it now sounded too bright. Nonetheless, musical passages that sounded congested in the midrange became clearer as more high-frequency energy was added. A better solution in my room was to rearrange some of the sound-absorbing material while keeping the Uni Balance treble setting flat. This reduced both congestion and excessive brightness. A Uni Balance button for additional bass was already installed in each speaker when they arrived. Removing them cut down the bass more than was desirable in my room; I put them back. How the Reference 203/2 was configured for biwiring also made a difference. The speaker has three sets of terminal posts on the back to permit triwiring or triamping. This flexibility proved a mixed blessing. Whether single-wiring or (as I did) biwiring, you need to use jumper cables to connect the speaker cables with the unwired terminals. To handle all possibilities, each 203/2 comes with two sets of jumpers (the manual charmingly calls them "shorting cables"). However, you then need to decide which part of the frequency spectrum you want to feed with the supplied jumpers, as opposed to your own carefully selected, high-quality cables. Curiously, the manual recommends that biwired speaker cables be attached to the treble and bass terminals, leaving the midrange to be fed by KEFs jumper. Even more strangely, when single-wiring, KEF recommends that you attach your speaker cables to the bass terminals, run one pair of jumpers to the midrange terminals, and then attach the second pair of jumpers between the midrange and treble terminals. In other words, for the audio signal to get to the treble terminals, KEF recommends that it go through your speaker cables and two consecutive pairs of jumpers -- not the best idea. Whether biwired or single-wired, there is a very good chance that the signal passing through one or two sets of jumpers will be degraded compared with the signal supplied directly from the speaker cables. My suspicions were confirmed when I compared KEFs suggested biwiring configuration with one in which the midrange and treble were fed directly by my speaker cables and the bass terminals received the signal through the jumpers. Simply put, the 203/2s worked best when I fed the midrange and treble with the best wires I had. The bass suffered a bit with the jumpers, losing a measure of definition, but it wasnt hurt nearly as much as the midrange was when fed with jumpers. If youre single-wiring, I suggest experimenting with using your speaker cables on the midrange or treble terminals, then directly feeding the other terminals with jumpers from the terminals attached to your speaker wires. A brief experiment in which I temporarily converted a spare set of fairly good speaker cables into 8 jumpers confirmed that you should probably forgo KEFs jumpers entirely and get ones of similar quality to your speaker cables. Finally, the 203/2s come with two different ways to attach them to the floor: spikes or round metal footers. Assuming that the spikes would do the best job on my hardwood floors, I was surprised when the footers made the bass sound clearer, and so used them for all my listening. I also did all my listening without the grilles, which made a positive difference across the sound spectrum. With the frequency balance and wiring setup finally satisfactory, I settled back to listen -- or, more accurately, I found myself jumping up every few minutes to hear how another piece of music would sound. The initial differences between my Triangle Stratos Australes and the KEF Reference 203/2s were quite striking. For one thing, as Id anticipated, the KEFs soundstage was rock solid. I wasnt really aware of how much the soundstage changed with the Triangles until it stopped changing with the KEFs. The differences werent hugely dramatic, but I became aware that, in the ordinary course of listening to image-defining frequencies divided between a tweeter and a midrange with centers 6.5" apart from each other, the image wobbles or blurs slightly. But with the KEF, whose tweeter has the same center as its midrange, there was no wobble, no blur. Everything was just right where it was, and stayed there. The level of detail conveyed by the two models was also noticeably different. As I understand it, my generation of Triangles was the last to be designed primarily by ear; the latest versions of their drivers benefit from computer modeling. But KEF has been modeling drivers on computers for decades. The drivers in the 203/2 seemed more crisp, better able to find the edges of the music. After playing the first two tracks from one of his favorite test CDs, the Blade Runner soundtrack [CD, Atlantic 82623], my audiophile friend Larry was excited in a way Ive seldom seen him. "How much do these cost?" he asked. "$8000 a pair," I told him, and he almost jumped off the couch. "These sound way over that price point. You can sell the Triangles, right?" I started to suspect a conspiracy . . . I cant help but think that the rigidity of the KEFs cabinet made a difference here, too. The Triangle is big and boxy, with flat walls; its heavier than the KEF, but the KEFs sidewalls are curved, and theres a natural rigidity to that geometry. When I held my hand against the side of the Triangle, I could feel every significant bass note; on the KEF, I occasionally felt something, but not as often and not as much. In short, fewer cabinet resonances were cluttering up the sound in my listening room. The 203/2s greater level of detail went all the way to the bottom of the speakers frequency range. As expected from the two speakers spec sheets, the KEF didnt go as deep as the Triangle, and this made a difference in the impact of music with dramatic bass lines. The performances on Loreena McKennitts An Ancient Muse [CD, Verve B000792002] and Carlos Santanas Supernatural [CD, Arista 19080] felt bigger and rocked slightly harder through the Triangles. But the KEFs articulated differences between instruments better and allowed me to hear more of the musics complexity. My concern that the ports proximity to the bass drivers might interfere with bass clarity proved unfounded. The midrange was equally detailed and complex, revealing more separation between instruments. This was the part of the frequency spectrum that benefited most from being fed directly by the speaker cables, which says something about the ability of the 203/2s midrange driver to transmit detail: Give it a good signal, and the midrange will convey it to your ears. The midrange gave impressive body and texture to male and female voices. Its integration with the treble was also outstanding, and not just because of their common geometry. The crossover did a very fine job with the transition from midrange to tweeter. The treble from KEFs titanium tweeter was good, but not quite up to the performance I heard at the lower frequencies. With the Uni Balance buttons properly adjusted, it was of comparable volume and extension to the Triangle. But it didnt produce quite as clean a sound, perhaps because its covered by a nonremovable metal screen. "[The screen is] there for two reasons," said Richard Colburn, Business Unit Manager for KEF Reference. "One is to aid dispersion at the highest frequencies (it goes out to 40kHz), and the other is more practical, to protect it from poking fingers on the retail floor." The result, for whatever reason, was a slightly less clean treble sound from the 203/2. I heard this with female voices, such as Eva Cassidy singing "Autumn Leaves" on Live at Blues Alley [CD, Blix Street 410046], as well as with violins and brass. A brief A/B test that revealed this clearly was the trumpet solo beginning at 1:53 into the recording of Pines Near a Catacomb, from Respighis The Pines of Rome, performed by Jes�s Lopez-Cobos and the Cincinnati Symphony [CD, Telarc CD-80505]. Played at the back of the orchestra and well off mike, through the Triangles the trumpet had the hard but warm overtones of brass and sounded ethereal, evoking Romes noble past. It was still impressive through the KEF tweeter, but seemed a bit heavier and more earthbound. What initially concerned me most about the KEF, however, was how acoustic timbres sounded. What I heard in my first listening sessions (keep reading, please: this is not the end of the story) was an edginess and brightness in many recordings of orchestral and chamber music. This was partially due to the way the highs were conveyed, but also, it seemed to me, because of how the midrange and midbass frequencies were handled. Compared with the Triangles, stringed instruments via the KEFs were less woody and resonant, and the highest pitches of strings and brass sounded more coarse, and harder to listen to over extended periods. Listening with me through the KEFs to the third movement of Tchaikovskys Violin Concerto, performed by Maxim Vengerov with Claudio Abbado and the Berlin Philharmonic [CD, Teldec 90881], Larry was a bit shocked. "Thats just . . . well, wrong," he said. "I never would have guessed that there would be such a difference with different types of music. How could they do so well with the details and sounds in Blade Runner and not with this?" His puzzlement mirrored my own. Id never before heard a speakers performance vary so much from one type of music to another. After Larry left, I tried a few things. I first changed the Uni Balance buttons to lower the treble emphasis. This helped somewhat, but the fundamental difficulty was still there, just quieter. I also switched the power cable on my CD player from the ESP Essence Reference to the Legenburg Hermes, which gives a warmer sound. And I fiddled with the vibration-control devices Ive placed under my components, softening their effect. None of these adjustments made the sound of acoustic instruments satisfactory through the KEF 203/2s. I was finally able to identify the problem by conducting a top-to-bottom analysis of the signal path and the power cables. Inadvertently, Id been using power cords for the amp and the power conditioner that did not give as clean a sound as my ESP Essence References. Returning the reference cables to their rightful places led to a great sigh of relief -- the KEF virtues that were easy to hear with less sensitive electronic music were now audible with acoustic music as well. Timbres were very similar to the Triangles, and the sound was significantly more detailed. The 203/2s were still slightly bright and somewhat forward, but the edginess was gone, and they were far easier and more enjoyable to listen to. I mention all this business about timbres and power cords to make a point: The KEF Reference 203/2 is far more sensitive to upstream components and cables than many other speakers. Both the Triangle and the Salk Sound Veracity HT3 speakers (the latter briefly reintroduced to the system for comparison) were far more forgiving with the identical setup of cables that had bothered me with the KEF. If the KEFs level of detail, integration, well-focused soundstage, and handsome physiognomy appeal to you, you may also be in for a change (and possibly an upgrade) of cables, and even electronics, to get them to sing as well as theyre capable of. The KEF Reference 203/2 is a remarkable and drop-dead-gorgeous loudspeaker. The product of a long tradition of innovative technology development, it offers excellent transparency and is outstanding at conveying detail. Its bass extension is adequate for all but the most bass-heavy music. Although its performance is sensitive to upstream cables and components, once properly dialed in, it is an impressive speaker. Its flexibility in adjusting to room acoustics and accommodating triwiring also makes it highly adaptable to different situations. Let no one say that the British dont have style. If I werent already in a significant relationship with a French loudspeaker, Id be tempted.